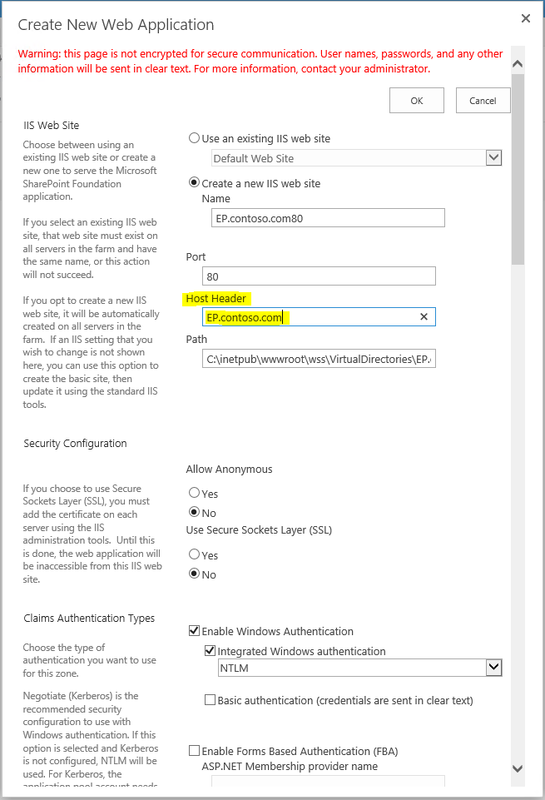 This blog post is written to clarify some steps in the installation guide https://technet.microsoft.com/en-us/library/dd309729.aspx when you install AX 2012 Enterprise Portal (EP) in a multi-server web farm. NOTE: It is important to follow the installation guide and use this post as additional complementary info. When installing EP in a multi-server web farm then you need to use host header. Review the SharePoint documentation about host headers and Web farms before you install Enterprise Portal. 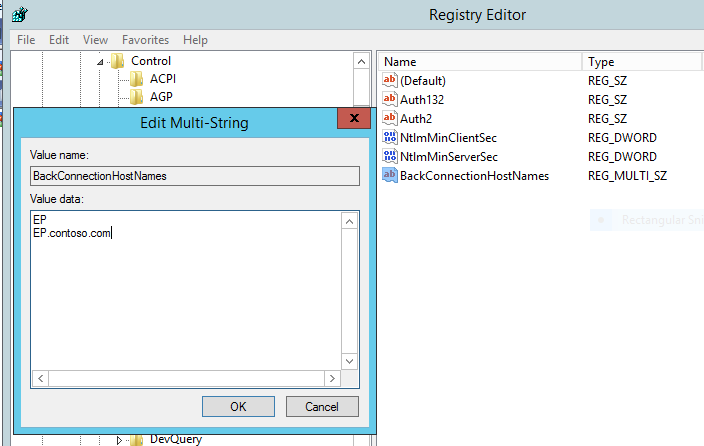 You need to add BackConnectionHostNames key in Windows registry on the Central Admin server through which you will be used for deploying EP and to all the SharePoint Web Front-End (WFE) servers that will be hosting EP. – See https://msdn.microsoft.com/en-us/library/cc982052.aspx and https://support.microsoft.com/en-us/kb/896861 for full details. If you intend to deploy Enterprise Portal in a load balanced multi server web farm, then you must use SharePoint Central Administration to create a new Web application using the host header before you install Enterprise Portal. 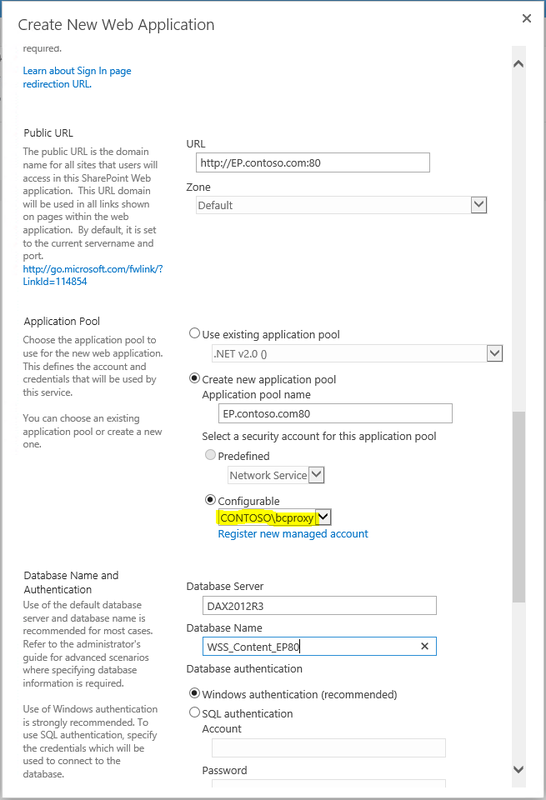 In “Install and configure SharePoint” point 1 it is stated: “If you are using a load balancer, specify a site name in the Load Balanced URL field on the Web application that will host the Enterprise Portal site”. This means that you should specify the load balanced site name in the Host Header field. You plan to use http://EP.contoso.com as the load balanced URL to access Enterprise Portal. In this case you need to specify the host header “EP.contoso.com” when creating the web application. 1. Log on to the server hosting the Central Administration Service as the SharePoint Farm Administrator account. 2. Open the SharePoint 2013 Central Administration site and under System Settings > Manage services on server, ensure that the Claims to Windows Token Service and Microsoft SharePoint Foundation Web application service is started. 3. In Application Management > Manage web applications, create a new web application on port 80 and set the host header name to “EP.contoso.com”. Note: Set the application pool identity under Configurable to be the same as your Business Connector Proxy User account defined in AX (Administration > Setup > Security > System Service accounts). 5. You create this site collection as a “Validation” step to verify that you are able to browse the site collection without any issues or errors from the Central Admin server, WFE servers and external devices, before proceeding to deploy Enterprise Portal. In order to browse from the CA, and WFE Servers successfully and to assist with EP deployment follow the steps in the “Hosts file” section below. If you already have configured the load balancer for the farm, then you need to edit the hosts file on each server in the farm before you install Enterprise Portal. When you browse to the load balanced URL it will be resolved to the IP address of the load balancer which will route the request to a Web Frontend Server (WFE). If you try to install EP without editing the hosts file, then the web application URL will be resolved to the load balancer instead of the local machine and the installation will fail. Add a line with local IP address mapped to host header on each server.